Our vision is to provide enhanced connectivity among a network of sidewalks, nature trails, and multi-use trails in and around Atlanta Memorial Park, both east and west of Northside Drive. 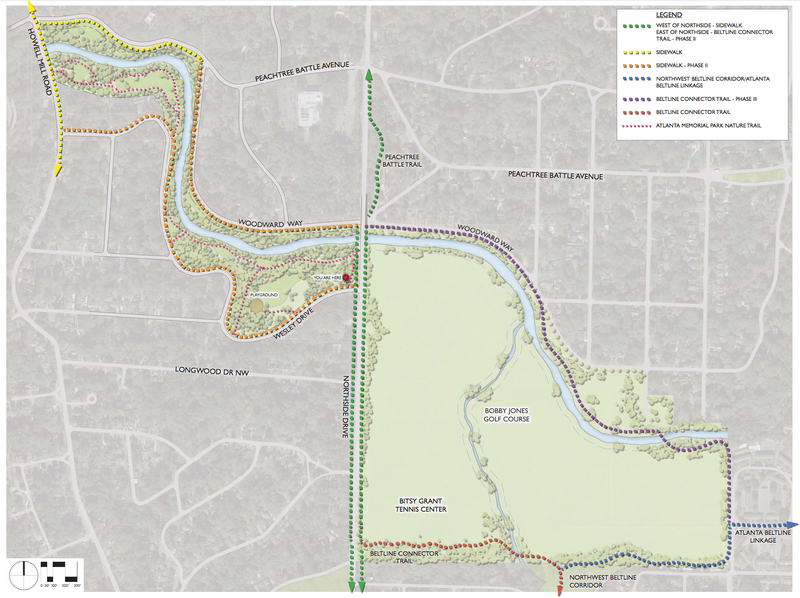 – Pathways around Memorial Park, under Northside Drive, around BJ Golf Course, BG Tennis Center and Recital Hall, all connected to the Beltline’s NW Trail. – Bike paths east of Northside Drive, crossing Peachtree Creek, connecting to the Beltline, and under Northside Drive to Memorial Park and Wesley Drive. – A flood-resistant nature trail through the interior of Memorial Park. – Working to secure the Northside Drive bridge underpass with GDOT, PATH, and BJGCF. – Readying the 5-foot sidewalk installation around Memorial Park. Coordinating with Renew Atlanta, HGOR Long Engineering and ASTRA. – Working with GDOT and neighborhoods on new bridge sidewalk and crosswalk designs. – Hosting community meetings about pathways, roads, bridge replacement, etc. – Launched the Northside Drive bridge underpass proposal. Continued advocacy and numerous follow-up meetings with PATH, GDOT and BJGCF have led to a bridge design to accommodate the underpass. – Secured funding and coordinated design and permitting of the sidewalk around Memorial Park. – Hosted meetings with PATH and neighborhoods for input regarding the multi-use trail design to loop around the golf course. – Secured funding for the Memorial Park nature trail. – Continue advocacy for the Northside Drive bridge underpass and surface walkways. – Host community meetings for Beltline updates and other connectivity issues. – Advocate for the maintenance and safety of the sidewalks, nature trails and pathways throughout Atlanta Memorial Park.